Happy Sunday Funday. I know some collectors are running amazing Twitter contests right and I hope that you have good luck with those. I have been on a contest tear lately. As a result, I want to pay it forward. I posted a picture of what will be given away. 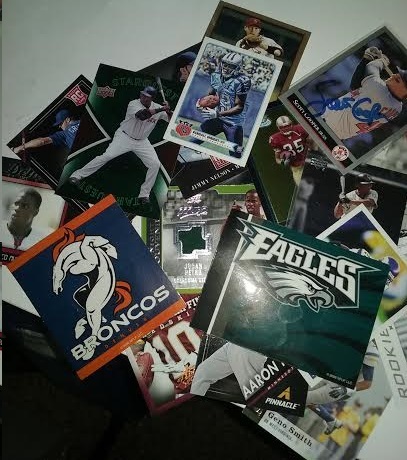 The giveaway will end July 31st, one hour after the MLB trade deadline. Why that time? Well because I know that is a heart-wrenching day to be a sports fan and I want to make it better for one of you-unless your team pulled of the next Jeff Bagewell/John Smoltz/Lou Brock/etc. deal, then I want to make your day better. Each day in between, I will post about a giveaway that I won, and highlight a piece of this giveaway. To enter: you must be from the domestic 48 states, unless you are willing to pay shipping, then by all means enter. You can only enter once. Simply comment on this post with your email address or Twitter handle. I will take all of the entries and place them in a randomizer. This post will be pinned to the twitter account. If you don’t see think that you will enjoy winning these cards, please pass and let someone who wants them have a chance. I would rather have people who want these cards to have a better chance at winning than have a lot of entries who don’t care. These are cards, and stickers, from my personal collection.